Some of these tools are manufactured by myself, the CDC and MIX Tool, the Bobbin.... A few of them like Stenzel vise and my scissors are produced by well known companies in Germany. The scissors for example, which are necessary if you use the best thread - dyneema - are produced in Solingen, Germany. The town Solingen is very famous for producing tools like knives and scissors since centuries. An absolute all round utensil. With this tool it is easy to double cdc feathers, as well as mixing cdc feathers with dubbing and also mixing different kinds of dubbing together. Set comes with one mix tool and one transparent clamp. Please check out our small movies on the left side about the handling of the CDC and Mix Tool. The language is German, but it´s easy to follow the movie. My bobbin is made of brass and coated with Corian, and takes standard sewing-machine-spools. It gives a good solid feeling in a tyer’s hand. The Scissors are made of stainless steel. When we started selling our Powerthread we found out that most scissors on the market fail to cut this thread. One of our scissors' blades is micro-serrated, and it works really good - as long as you refrain from cutting lead or wire. One of the tying tools from another German manufacturer. This are not new scissors, often called as 6 Finger Scissors, but new is that one of the blades is now micro serrated. This is absolutely necessary if you use Dyneema thread for producing your flies. This Scissors are made of stainless steel and made in Germany. This ceramic bobbin is an excellent choice for tiers using spools in many different dimensions. It handles everything from small sewing machine spools to small or large plastic spools without a problem. 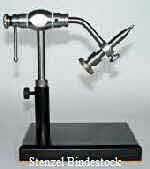 The ceramic tube is smooth both on the front and the rear end and works well with thread, floss or even ribbing wire. 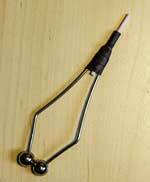 This Material Clamp is a fine tool for introducing almost any material mix into your dubbing loop. It is possible to finish a artificial body in one single step. Also it easy use with any kind of hair, buck or deer etc. The clear plastic material allows you to monitor your material inside the clamp at all times. One of the utensils from another German manufacturer. 1) Take dear hair from the hide by means of the large clamp. The clamp will be well filled and contain too much hair for one fly. Now you use the small clamps to take half of the hair in each, permitting you to tie two flies with the hair you cut off the hide. 2) You want to tie one entire fly with one fill of the clamp, but you want to use different materials on abdomen and thorax. You fill one small clamp with the materials for the thorax, the other one with the material for the abdomen. Now you transfer the contents of the two small clamps into one large clamp and then into one dubbing loop. Twist it, tie it on, done! The above can be done particularly effectively using my CDC and Mix Tool! Rotary vise made in Germany. This Vise is a real nice product and work with a new, unique fixing system to hold the hooks. A small steel needle holds all hooks from 22-6/0 safely in place! Very quick and strong operation.No more chipped heads! 5 years warranty on the head! The rotating head is made from stainless steel and duraluminium, it contains 2 ball bearings. There is a extra drag to adjust rotation speed. The vise includes an extra heavy pedestal plate suitable for all kinds of surfaces. One of the utensils from another German manufacturer. If you have any further questions about my products, please feel free to contact me.